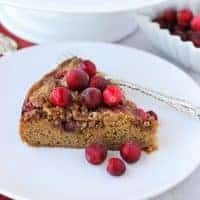 PALEO Cranberry Streusel Coffee Cake! An EASY, grain-free holiday breakfast recipe! Preheat the oven to 325 F. Lightly oil a 9-inch springform pan with coconut oil. You can also use a 9-inch cake pan if you don’t have a springform pan. For a regular 9-inch cake pan, lower the oven heat to 315F. In the small bowl of a food processor, pulse together all the ingredients for the streusel until the pecans are chopped. Set aside. In the large bowl of a food processor, add the melted coconut oil, maple syrup, eggs, and vanilla. Process to combine thoroughly. Add the almond flour, coconut flour, baking soda, salt, cinnamon, nutmeg, and zest. Process until smooth, about 30 seconds. Pour the batter into the prepared pan. Sprinkle the cranberries evenly over the top of the cake. Sprinkle the streusel mixture over the cranberries. Bake for 50-55 minutes until a toothpick inserted into the cake comes out clean. Cool on a rack for 15 minutes in the pan. Then remove from the springform pan and allow it to cool completely. If using a cake pan, just allow the cake to cool completely on a rack. Later you can just serve it from the pan. Meanwhile, make the glaze. Place the coconut sugar and arrowroot powder in a high-speed blender. Process until fine and powdery. Pour into a bowl and add the orange juice and vanilla extract. Stir to combine. Pour the glaze over the cooled cake. Enjoy!